Figure 1. DNA basic parts domestication into GB. Second construction refers to RBS. Part BBa_K2656008 is the original RBS BBa_J61100 standardized into the Golden Braid assembly method. Thus, it is a very weak RBS compatible both with the BioBrick and Golden Gate grammar. It also includes the BioBrick equivalent scar in the 3' extreme, so the insertion of this supplementary bases ensure correct spacing for the ribosome to bind to. 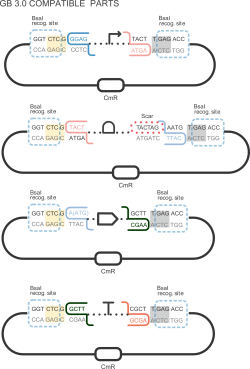 Using the Golden Gate assembly protocol , it can be combined with other Golden Braid basic parts, such as the ones from our Valencia UPV IGEM 2018 Printeria Collection, to assemble transcriptional units in a single BsaI one-pot reaction. We have also calculated the relative force between the different RBS, taking BBa_K2656009 strong RBS as a reference. It has been defined as the quotient between the values of the protein in equilibrium of the results of the simulation of one RBS and the reference RBS. Likewise, a ratio between p parameters of the different RBS parts and p parameter of the reference RBS has been calculated.